Hello all– If you go into our back yard and peek through the fence, you can see our neighbor, Mr. Wicks’ garden! Really more of a mini-farm. Fruit trees and all kinds of squash, green beans and loaded tomato bushes eight feet tall! And he’s generous. Giving out fruit and his famous roses to neighbors who pass by. And we are the often happy beneficiaries of his bounty– this week zucchini and yellow squash! And of course, the best way to use any lovely food is to roll it into a taco, in this case a tostada. Thanks Mr. Wicks. They were delicious! Heat the olive oil in a nonstick skillet. Mix the cumin, salt & pepper in a bowl. Cut the chicken into flat filets and dredge it in the cumin mixture. Set it in the hot pan and cook 2 to 3 minutes on each side. Take the chicken out of the pan to a cutting board and cut it into small bite size pieces. In the same skillet, add the chopped red onion, zucchini and corn. Cook for 2 minutes. Add in the salsa verde and cilantro. Mix. Take it off the heat. Set the tortillas onto a baking sheet sprayed with cooking spray. Brush the tablespoon of olive oil onto the tortillas. Set them under the broiler on a medium heat setting for 1 or 2 minutes until they are crispy and lightly browned. Then stir the chicken into the zucchini mixture and heap it onto the tortillas. 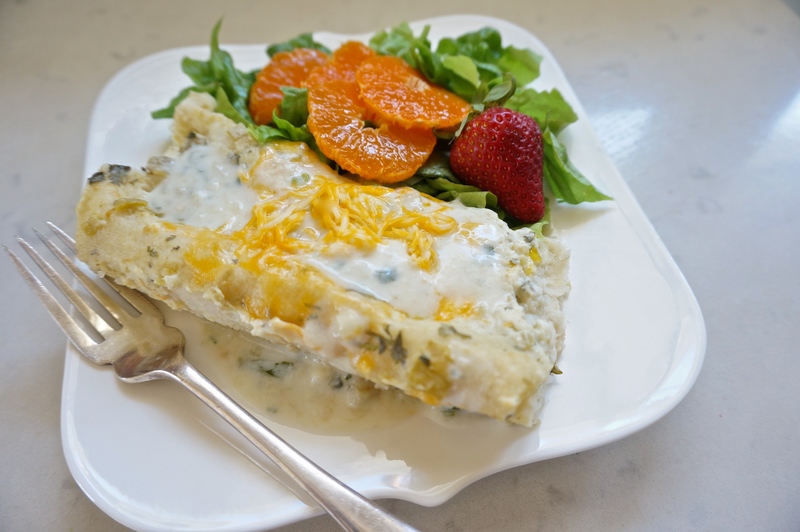 Sprinkle the cheese over the tops and set them back under the broiler for just a minute until the cheese melts. Garnish with cilantro & avocado. Add a crispy salad and dinner is ready!! Hi all– If you love Mexican food as much as we do, I think you will love love this green sauce! It’s the best all purpose sauce– on tacos, enchiladas, nachos, chicken, fish and just for chip dipping… And so delicious. I couldn’t stop eating it!! Got this scrumptious green sauce from Melody on her friendly Texan blog– Meals with Mel. She’s a pro when it comes to Mexican dishes. And this is one our favorites!! Put all the ingredients into a blender and whip until it’s smooth. Refrigerate until you’re ready to use it. P.S. The recipe I worked from called for 2 cans of salsa verde and optional jalpeno or serano pepper– You might want to spice it up, but this version is just spicy enough for me. Hello friends– Well, the best thing that happened around here this past weekend was an unexpected visit from our son, Micah– down from Ojai– We sat down to dinner and talked late and visited his grandma recovering from her surgery. Got to catch up on so many details and see more pics of the grand-girls in China right now. It was just about perfect. So you know when he called to say he was coming, the first thing I thought of was, “what shall we eat? !” And this is what I thought he’s like. Maybe you will too. Cut the pork into 2″ chunks. In a baking dish mix 1/2 cup water with the liquid smoke. Set the pork pieces into a baking dish and top them with the 4 cloves minced garlic and the onion cut into large pieces. Put the pork and onions into a 350 oven for 2 hours. Take it out and see if it is tender enough to shred with two forks. If it isn’t, put it it back in the oven for 30 minutes more– and the shred the meat and mash the cooked onions and mix it all together. Set aside. Melt the butter in the pan. Add the flour and garlic. Stir to make a paste and then pour in the chicken broth and milk slowly as you continue to stir to make a white sauce. After about 3 or 4 minutes, when it thickens, mix in the green chilies, cilantro and salsa verde. Mix the sour cream into the sauce that is left in the pan. Then spoon the remaining sauce over the enchiladas. Cover them with foil and bake at 350 degrees for 30 minutes. The last 5 minutes of baking, take off the foil and sprinkle a little more cheddar on top for a nice color. And here’s the Grand-girls in Hunan, China right now, dressed in their best for Chinese New Year! !—spending the holiday with their other dear grandmother there. 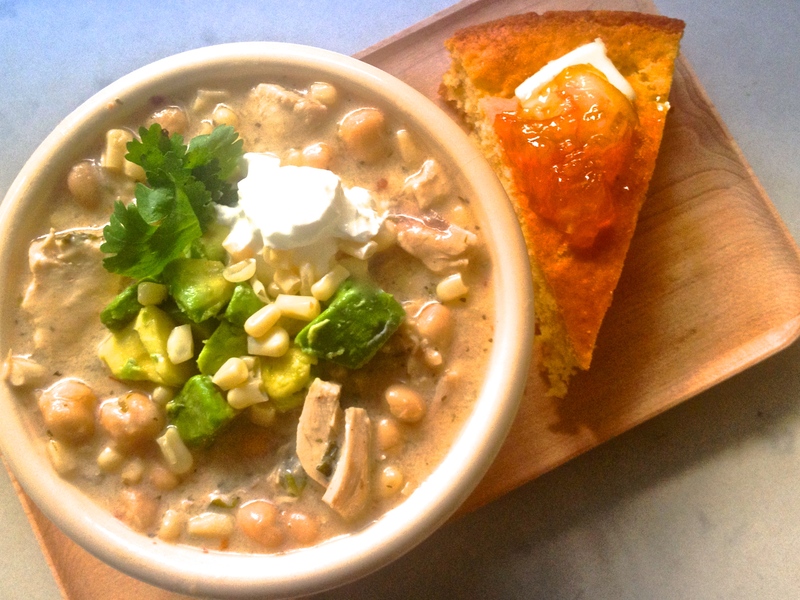 Hey friends– Here’s a light soup for a blustery day. 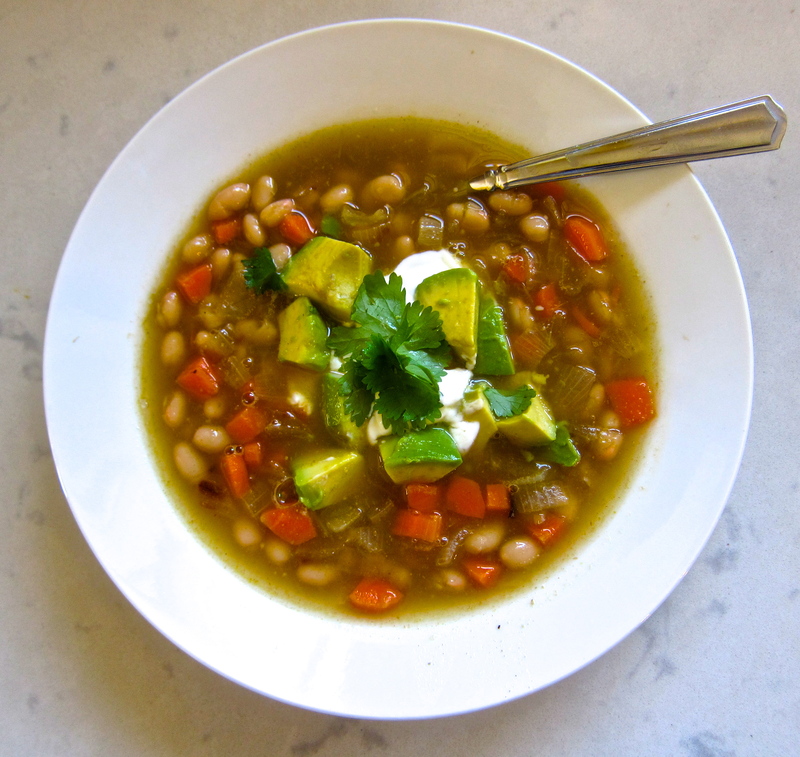 Well, it’s not exactly blustery here, but soup still tasted great–white beans and carrots with all the added flavor of garlic, cumin, salsa verde and lime– and topped off with the smooth richness of sour cream and avocado… oh, and a bit of cilantro. Heat your soup pot with a splash of olive oil in the bottom. Throw in chopped carrots and onions and cook until soft. Take the lime and finely grate off 1 tsp. of the peel and squeeze out just a tsp. of lime juice. To the pot, add in the minced garlic, cumin, red pepper, salt, chicken broth, water, beans, lime peel and juice and salsa verde. Heat it to come to a friendly low boil. Let it simmer about 15-20 minutes to meld the flavors. If you want the broth a bit thicker, shake up 1 tsp. cornstarch with 1/4 cup water in a closed container and stir it into the bubbling soup. 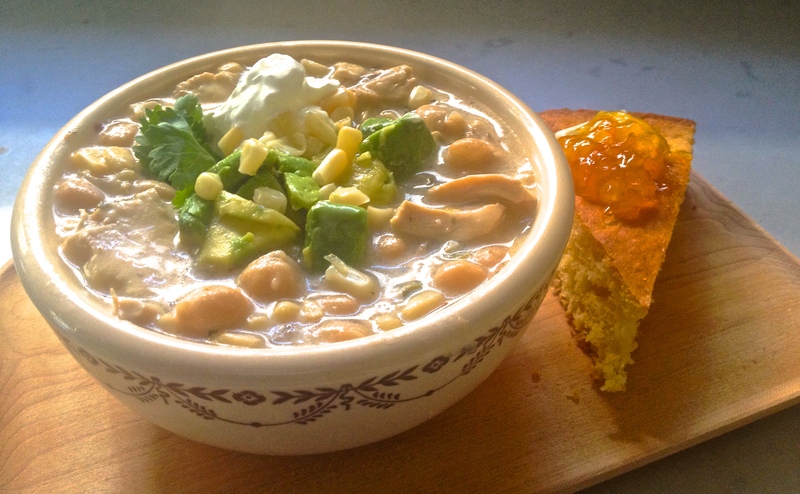 Serve it up steaming hot with a blob of sour cream, chopped avocado and bits of cilantro. With a big salad of fresh greens, orange wedges and radishes– along with a pan of cornbread, this is a warming winter meal. Enjoy!